Notes: "A fine example of an enclosure. The walling consisting of very large stones reaching a height of one metre. It contains three hut circles and a number of courts situated mainly on its north and western sides. There is no obvious entrance." Lethbridge p. 74, diagram p.71. Hook Lake on Megalithic Portal. Notes: Dixon Brown Heath Cist #40. Bar Rep. 38. Butler Hook Lake stone row - Vol. 4. Map 55.8 (pp.78-9). Grinsell HARFORD 3. "A double stone row, on Brown Heath, circa 540 feet in length, direction of length N 10o E. At the north end is a stone circle, diameter 31 feet, surrounding a cairn which contains the remains of a cist." Ruined and possibly no longer visible. Notes: Turner Stone Circle G19. Probable cairn circle. "A small, probably sepulchral, stone circle. It consists of 14 stones arranged in an 'egg' shape. The long axis is 9.9 metres aligned due east by 8.2m transversely. A further 7 stones are in close proximity but may not be associated. There is no trace of a cist or cairn." 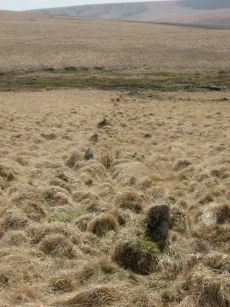 "It is largely obscured by long tussocky grass and the absence of a discernible cairn or cist makes it an unusual site by Dartmoor standards". Notes: Dixon #96. Grinsell HARFORD 2. According to the NMR record "noted by Hankin in July 1976, perhaps in a small cairn diameter 3.7m and height 0.3m. It is now filled in and Grinsell failed to locate it, 'it seems never to have been planned if it ever existed.'" This cist was listed by Dixon in 1952 70th Barrow Report (T.D.A Vol 84) with Dixon #96. It is not listed in prior Barrow Reports - and appears towards end of Dixon's list, so presumably discovered/reported late 40s to 1952. Not listed by Butler (area covered in Vol. 4. Map 55). Not listed in Hankin's 'An archaeological check-list for Harford'. Notes: Butler Map 55.7 (diagram Vol. 5. p.180). Grinsell CORNWOOD 8 (Stinger's Hill). "A cist 1.20m. by 0.60m. with a close set retaining kerb circle 4.0m. in diameter is situated on Stinger's Hill opposite Erme Pound". Lethbridge Stingers Hill cist p.73. diagram p.71. The NMR gives SX63376494 as the grid reference - this error is replicated in HER entry 28468 . The present author could not find a cist there. As PMD points out that is the location of Grinsell's CORNWOOD 9 cairn and not CORNWOOD 8. Notes: Dixon #102. Bar Rep. 69. Butler Brown Heath (Cairn 3) - Vol. 4. Map 55.7.3 (p.76-7 diagram p.76). Grinsell HARFORD 1 (Redlake Foot). 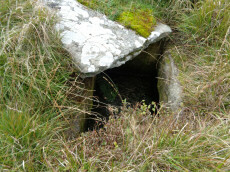 "A fine cist at Redlake Foot measuring internally, 0.7m. by 1.0m. and 1.0m. deep single slabs form the end-stones and the southern side-stone. The northern side is a slab resting on a horizontal 'post' type stone" Cover slab partly displaced from the sides. Lethbridge p.73, diagram p.71. Notes: "A round cairn, measuring 13.8 to 14.6m diameter and 1.0m high. It lies on a false crest, adjacent to a stone row, SX 66 NW 20, and just above the River Erme, at 380m above OD, is constructed of small boulders, and has a central hollow, 0.7m deep. In fair condition, though a small shelter has been built on its north side." Notes: Western Whittabarrow or Whittaburrow. "A large cairn measuring 21 by 17.5 metres wide with a maximum height of 1.7 metres. It has been badly mutilated by the construction of a two room building within it."